South Korea is moving to battle online gaming addiction by forcing underage gamers off the internet. A new policy announced by the Ministry of Culture, Sports and Tourism will literally force underage gamers off the internet once midnight rolls around. It is part of a twofold initiative to fight teen gaming addiction. 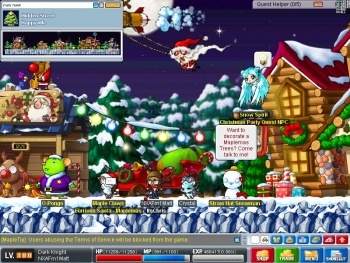 Popular MMOGs like Maple Story and Barameui Nara will all have this system implemented by the second half of the year, and the program is intended to eventually encompass the 19 MMOGs that make up 79 percent of the Korean online gaming consumption. In addition, the system will also force a reduced, slower performance when it detects underage gamers have been playing for too long. Using the registration, the game will be able to differentiate between underage and above-age players, but there are also plans for ways to stop underage gamers from using their parents' resident registration numbers to keep gaming, though no details on that plan have been released. The pressure for action has been stepped up recently due to a number of reports of gamers dying of exhaustion after playing for too long, as well as the shocking story of a three-month old girl dying due to starvation and neglect. While critics feel the measures may not be enough to simply prevent underage gamers from simply bypassing them, there is still a push within the country for strong measures to help prevent these problems.